Research into acupuncture as a medical treatment has grown exponentially in the past 20 years, increasing at twice the rate of research into conventional biomedicine. Over this period, there have been over 13,000 studies conducted in 60 countries, including hundreds of meta-analyses summarizing the results of thousands of human and animal studies. A wide-variety of clinical areas have been studied, including pain, cancer, pregnancy, stroke, mood disorders, sleep disorders and inflammation, to name a few. Antibiotic-Resistant Infections Doubled – Since 2007 in Europe More than 33,000 people died from antibiotic-resistant bacterial infections in the European Union and European Economic Area(EU/EEA) during 2015, a recent study has found. UK clinicians urged to prescribe acupuncture to help ease NHS pressures. Clinicians in across the UK are being urged by the British Acupuncture Council to consider referring their patients for acupuncture to treat a range of different conditions. Antidepressants for postnatal depression may not be acceptable to women and so many may seek alternative therapies. antidepressant treatment. A literature search was conducted in English, Chinese, Japanese and Korean databases. Details of the trials were extracted and analysed. Of the 1592 studies reviewed, three met the inclusion criteria for quantitative analysis. Two studies reported no significant differences between acupuncture and fluoxetine for depression, while the third reported significant improvements. Acupuncture in postpartum depression was at least as effective as fluoxetine hydrochloride, supporting the notion that acupuncture may be a safe and effective option. A randomized clinical trial published in the recent issue of JAMA demonstrated among women with stress urinary incontinence, treatment with acupuncture for 6 weeks resulted in significantly less urine leakage comparing with sham acupuncture. The results of a survey sent to 89,000 acupuncture patients treated between 2014 and 2015 were recently released and showed the levels of patient satisfaction exceeded national benchmark averages of conventional care providers. 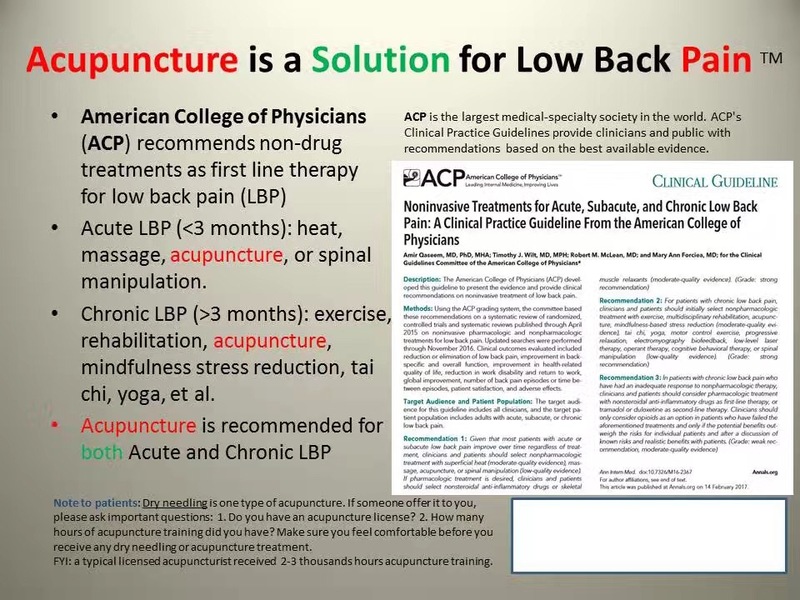 This is really great news for both the public and the acupuncture profession. It is one thing to tell people that acupuncture is effective and acupuncturists are highly professional but here we have the results of a government developed survey tool, administered by an accredited, third-party vendor, that shows what real acupuncture patients have to say about their experience with their acupuncturist. Most of the patients in this survey were treated with musculoskeletal pain syndromes especially with low back and neck pain as the top two conditions. Now new research suggests acupuncture could cut the number of hot flushes women experience by half. In a study published in the journal Menopause, more than 200 women who had on average at least four hot flashes or night sweats a day were divided into two groups. Taking a common kind of painkiller is linked to an increased risk of heart failure, a study suggests.Non-steroidal anti-inflammatory drugs (NSAIDs), such as ibuprofen and naproxen and diclofenac, are commonly used to treat pain and inflammation.The British Medical Journal study looked at 10 million people, aged 77 on average, who took the drugs. The impact of acupuncture on IVF success rates: a randomized controlled trial K. Gillerman1 , N. Rehman1 , M. Dilgil1 , R. Homburg1 1 Homerton University Hospital, Homerton Fertility Centre, London, UK Study question: To examine in a sufficiently powered prospective randomized controlled trial, whether acupuncture during IVF treatment can improve IVF success rates. Summary answer: Acupuncture during IVF treatment significantly improves IVF success rates compared with a basically similar control group having no acupuncture. What is known already: Clinical trials to assess the benefits of acupuncture on IVF treatment results have differed in study design, protocol, outcome measures and commercial bias. This heterogeneity has precluded any firm conclusion regarding the efficacy or otherwise of acupuncture in this field. To address this heterogeneity, 15 international acupuncturists participated in Delphi questionnaires and reached a consensus protocol to be used in future research which, so far, has not been implemented. To the best of our knowledge, this is the first study to use this newly agreed standard protocol. Study design, size, duration: In this single-centre RCT, conducted over 1 year, according to the power calculation 160 couples were randomized into two groups using computer generated randomization numbers distributed consecutively by central telephone. One group received acupuncture treatment 4 times spread throughout the treatment cycle in addition to our standard IVF protocol. The other group went through the identical standard protocol but with no acupuncture. Participants/materials, setting, methods: All couples in the study were undergoing their 1st or 2nd IVF cycle, age 23–43, BMI < 30 and consented to randomization before their treatment cycle. Those randomised to the study group (n = 80) received acupuncture based on the Delphi consensus protocol, between days 6 and 8 of ovarian stimulation, before egg retrieval and twice, before and after, embryo transfer. For both groups the IVF protocol was decided by the clinician, blinded to randomization. Primary end point was live birth. Main results and the role of chance: To date, a total of 127 results are available and have been analysed, 67 in the acupuncture (study) group and 60 controls. So far, the total ongoing pregnancy rate in the two groups is 34.6%. This comprises an ongoing pregnancy rate of 31/67 (46.2%) in the acupuncture group and 13/60 (21.7%) in the controls (P = 0.004). Two couples withdrew from the control group. Live birth rates are being closely followed up and will be reported. Limitations, reasons for caution: The additional attention paid to the acupuncture group as opposed to controls may have had a positive psychological influence. Wider implications of the findings: The results of this study imply that acupuncture may be offered as a possible method of improving IVF outcome. This study is the first to follow a widely approved consensus protocol and therefore has settled disagreement in the literature and resolved previous disparity.